The thrill comes when the plants produce something you can use. I used to just love cutting flowers, especially roses, and taking them inside. When you walked past, the smell was glorious. Now, I enjoy watching my children watch the fruit grow on the trees, the brocolliini sprouting in the hydroponic garden bed and we are currently watching the grass grow. 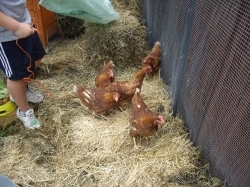 The Vegie Patch is next, we have 5 chickens which are doing a stirling job of creating enough fertiliser and compost to fill our new veggie garden and then we are going to start planting it out. We have a wonderful big yard with a nice northerly aspect where the veg will go, but have to cut back a few branches. The plan is to follow the guide in Organic Gardener Magazine, which I love. As we only moved in 8 months ago, we are still removing a lot of dead and dying useless plants that produce nothing. It was a rental for 6 years, so nothing was tended or loved properly and a lot is cheap filler plantings. I'm going to turn it around, so that the whole garden is productive in different ways. I need shade, fruit, veg, chicken feed, flowers, privacy hedging and I have a huge flowering gum with lots of lovely bees. My next question to the council will be about whether I can have a Bee Hive?? What do you think? 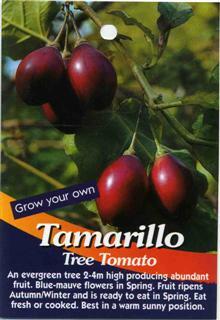 I eat Tamarillo\'s when they are in season with Greek Style Yoghurt for breakfast, lunch and dinner. They cost about $2 each, so my hubby tries to restrict the number I buy as it shoots the cost of grocery shopping through the roof. It would be so much easier if I could grow my own! !